Barking Dogs: Knowing why they bark and what to do about it. “Take time to give your ‘best friend’ lots of attention and lots of love. What about kids? Are all kids bad kids unless they are quiet? I don’t think so, and I believe the same goes for dogs. When your child wants to communicate something to you or someone they love, they simply speak out. Dogs have a voice, too. When they have something to say to the people they care about, they bark. Barking dogs aren’t quite as easy to understand as humans, but they still like to communicate. Some people (my brother, for instance) encourage their dogs to bark, uh, talk. They actually carry on a conversation with their dog, or so it seems. To them, barking dogs are brilliant elocutionists who simply need a little encouragement to speak their mind (if it's not my own dog and my own doing, I like the idea of noise canceling headphones). The secret, then, is to properly interpret the barking dogs' language. When you consider the context in which the barking occurs and what the dogs is doing at the time, e.g., moving excitedly, focusing viciously, running happily, etc., it is possible to interpret their "words." Great question, but not so easy to answer. That's almost like asking why five year old girls talk, and talk and talk! There are a variety of reasons, which we will explore here. annoying bark. However, these "scent hounds" were bred specifically to use their strong sense of smell to track game (in the case of the Beagle), and human beings (in the case of the Bloodhound). Their bark is actually a tool. Then you have the talkers. Barking dogs who simply love to bark. Why? To hear themselves, of course. Yippers, yappers, squeekers, yakkers, etc. example: boredom, hunger, loneliness, the need for a bathroom break, they are feeling playful, etc. In these situations, you may want to "choose your battles" and realize you own a dog. Yes, dogs DO bark under certain circumstances. If you don't like this condition, you may want to buy a pet turtle. You are sitting on the deck on a beautiful, sunny afternoon, sipping a glass of iced tea and enjoying a pleasant conversation with your Father. Then it happens. Bark (Play ball?!). Bark! (Play ball, NOW?!). BARK BARK!! (I want to play ball, and I will not give up until you come play with me!!!). Solution? Put the dog inside and listen to her scratching the door to come out and, you guessed it, play! Throw the ball under the deck? Yell at the dog, setting a great example for your children and your Father's 11 grandchildren? Oh, no. You get up, spill your iced tea, and throw the stinking ball. Over, and over, and over again. No more barking dog. If you have never been in the armed forces, you may or may not realize the critical importance of the "chain of command" and respect for your leader. Being a dog owner is not a lot different. Much like the commanding officer respects and cares for his or her soldiers, the dog owner must respect his or her dog. This respect is shown in the way you care for your dog, with proper feeding, grooming, and affection. This means a lot to your dog. The commander must be worthy to receive respect from the commanded and visa versa. Your dog must respect you in order for her to be worthy of your respect. Owning a dog is not about being on equal standing with your animal. You are in charge and she is not. You are the boss and she is your pet. If your dog knows you are in charge, they are more likely to be on their best behavior. They will actually be happier. In the previous example (dog, Dad, deck, etc. ), my sister's dog was not showing any respect. She was actually bullying us to play with her. What did I do in response? I caved, which actually reinforced her BAD behavior. What was I teaching her? That a barking dog is OK, and that she should bark when she wants something, and that she should keep barking until she gets it. Why? Because I proved to her that she WOULD get what she wanted if she just kept barking. Bad boy (me!). Does this mean playtime is not good? No. It simply means that I must set the rules and stick by them. Otherwise, the noise police may come a calling, or I may ruin a perfectly good, loving and affectionate dog at no fault of her own. What does that look like? Stand up or move away from her and physically turn your back on her. At this point you must not look at her, you must not acknowledge her, and you must not speak to her. Not one word. That's it? That's all it takes? Not quite. You will likely experience an INCREASE in barking in the beginning. This will be especially true if YOUR bad behavior, i.e., giving in to her bullying, has been the norm for some time. It's hard to break bad habits, and this is no exception. She's thinking, "this worked before, right? I'll just keep barking until it works again." What's the most important word when dealing with barking dogs, or any kind of training for that matter? Consistency. Prior to now, you may have been consistently reinforcing bad behavior. Now you must begin reinforcing good behavior with absolute consistency. Don't give in, no matter how persistent she is. Is there a quick fix for barking dogs? 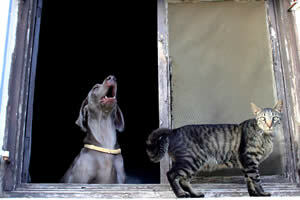 While your dog is barking, don't react too quickly. Wait a moment and let her get it all out, or at least some of it. Let her have her say and give her a chance to calm down on her own. If that doesn't work, place your hand (or hands, depending on how big your dog is) around her muzzle and hold her mouth shut firmly but gently. She may try to pull away, so it's a good idea to hold her collar in the other hand if you can. Why does this work? Number one, it quiets her barking. Number two, it let's her know you are the boss. She will know you are nice, but you won't put up with disobedience. When should you let go? As soon as she stops trying to pull away from you. Once that happens, you will know she has accepted the fact that you are the boss. Wait a couple more seconds, then let go and give her a healthy dose of praise. minutes of exercise a day is enough. For dogs, it's more like 60-90 minutes a day. That's a big commitment for most people, but different dogs have different needs, depending on their breed, age and overall health. Sometimes, owners think their dogs are getting enough exercise, but they are still barking excessively and exhibiting unwanted behavior, such as nervousness, agitation, aggression, etc. If that is the case, more exercise really will help, and they need it. The good news is that you can fix the problem if you have the time and desire to do so. You just need to exercise your dog more. Can you get up a little earlier in the morning? Carve out some time before or after dinner? Or hire someone to help? Use your imagination. On the other hand, imagine a life-long relationship with an over-active dog that is forever exhibiting unwanted behavior. Not! of love. Your ears (and your neighbors) will thank you.